It looks lovely - already thinking about spring? I took my Peskycat out for a spin this morning... I love it! Love, love, love that color blue! Great combo! Your shop has been on fire lately. Congrats on all of the sales. Gorgeous! I can`t wait to see the new designs..I will have to get one of these beauts when I have more coinage..hehe. I love them. 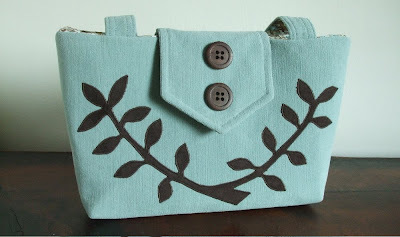 adorable bag! I love the color. Just when I think your purses can't get any yummier - you make yet another amazing bag in beautiful colors with a dreamy texture. Great job! What a gorgeous color. It's so lovely! Because this color is romantic, this color is clear , friendly and just like a new baby ! Again and again dear friend bravo !